Time and accuracy are the traditional methods for measuring marksmanship performance. Throughout the US, law enforcement and military organizations rank their shooters proficiencies through qualifications (or quals) that rely primarily on static shooting scores. But as many of you reading this can attest, these types of quals are inaccurate measurements because they only assess performance at the lowest levels. On top of that, most quals ignore a principle feature of tactical shooting: the ability to shoot on the move. In absence of quals that truly assess performance, teams will shoot a qual to satisfy an administrative requirement, then proceed to perform their own training that is more challenging. However, this can be problematic as well. Or those cardboard and steel targets? Look, there’s nothing wrong with framing the learning environment with experiences from the tactical environment. Unfortunately, a lot of tactical drills reward shooters for unnecessary arousal and wasting energy. Worse, certain drills specifically correlate and reward mental anxiety with the need to use lethal force. Now, I understand that there’s no single correct way to learn. But too often we are not harsh enough critics of our own training environment. For example, in the military and law enforcement there are rarely any incentives for rewriting training doctrine. Why create more work for no additional pay? Consequently, stale doctrine gets passed down the ranks and an organization will train a certain way not because it is effective, but because it is their culture. As individuals, we might not be fighting against an organization’s methodology, but we can still measure the wrong aspects of our performance. For example, I’ve witnessed hundreds of students come through classes and perform as rockstars while shooting static drills from the 7 to 25 yard lines. Whether multiple target engagements, reloads, or fixing malfunctions, these shooters are full throttle the moment they hear the shot timer’s beep. Unfortunately for these shooters, the introduction of movement tends to downgrade their performances. Adding just a short run to a reload drill is enough to stall their performances, which then frustrates their execution while shooting. Typically these shooters hang their heads afterwards or start muttering profanities under their breathes. Although disappointment is part of the decompression process, it can also be a huge red flag that is indicative of a bigger issue. It’s one thing for a shooter to physically underperform. It is a whole other issue if a shooter must divert energy to mentally think through patterns—such as a reload—or even to calm himself down. This type of individual is likely to be a liability on target because he has not learned how to maximize his recovery time, or learned to adapt his skills to unfamiliar circumstances. Observing these issues enough, I’ve decided it’s best to minimize tactical concepts as much as possible in performance oriented training. What was formerly Guerrilla Approach “Tactical Marksmanship” courses is now Functional Marksmanship Movements (FMM). More than just a name change, this shift in programming places a premium on athleticism that can be applied to all shooting environments. At the core of FMM is the use of movement as a measurement of performance as opposed to solely relying on time and accuracy. The use of time, accuracy, and static shooting drills is not wrong. However, we achieve a better indicator of performance if an individual shoots a bullseye target after running into position. Such is the case, static shooting develops skill, while shooting and movement determines the depth of proficiency. Emphasizing movement also encourages shooters to ditch learning techniques that merely rely on regurgitating a drill’s sequences. This is best witnessed in the popularity of drill cramming, in which shooters add patterns only for the sake of adding patterns to an exercise. What results is drills that reward shooters for performing drills, not for actually improving any applicable skill. Even so, FMM is not just running around with a gun, or exaggerated range fitness exercises. Material also focusses on form and technique so that shooters understand how to actually increase speed, work capacity, and the application of marksmanship. Too often, shooters are guilty of designing stress shoots that promote high levels of physical activity, but then fail to actually teach methods for increasing movement efficiency. FMM drills remedy this by teaching explosive acceleration and deceleration into and out of shooting positions. Although we can use body, dashboard, and drone camera footage to observe how real fights unfold. We cannot fully predict what our fight will look like the day it happens. However, we can say with certainty that there will be some movement involved. Whether that’s creating space during an officer involved shooting around vehicles, or running three miles through the desert to access a safe house. 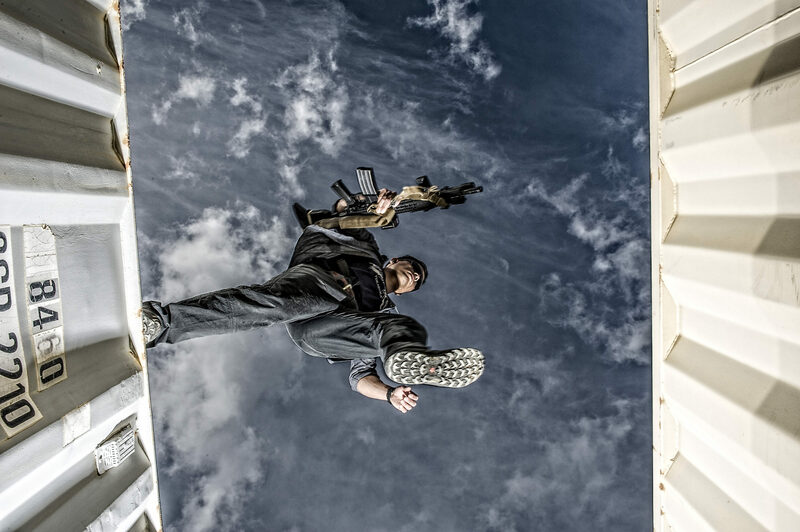 Functional Marksmanship Movements prepares shooters for the uncertainty of a real fight by developing movement skills that can be applied to any environment. Programming is holistic and discourages the prepackaged course format that only makes shooters good at signing up for other training courses. Functional Marksmanship Movements is a success if you find the material practical yet challenging, and leave with the discipline and motivation to continue pushing yourself at elite levels of performance. Check back in with our social accounts tomorrow (2/1) for a full course trailer.